Deric's MindBlog: The amygdala as the neural source of personal space. The amygdala as the neural source of personal space. It turns out the amygdala, known to be important in our social interactions, may also be the core of regulating our personal space. (Americans and northern Europeans prefer a larger personal space than southern Europeans, while people with autism tend to unknowingly invade others' personal space.) Here is a a clip from a ScienceNow account of studies on a 42-year-old woman with a rare genetic disorder that destroyed both sides of her amygdala. In early experiments, the scientists discovered that the woman, referred to as SM, couldn't spot fear in other people's faces; she also rated people as more trustworthy than an average person did. And she was extremely outgoing, "almost to the point where it isn't normal," says team member Daniel Kennedy. Even if she's only just met someone, he says, SM will invade their personal space--touching their arm as she talks or poking their stomach...In the new study, Kennedy and his colleagues more rigorously tested SM's sense of personal space. They compared her with 20 healthy subjects in a series of experiments. In one test, an experimenter slowly walked toward a subject until the subject felt uncomfortable and told the experimenter to stop. 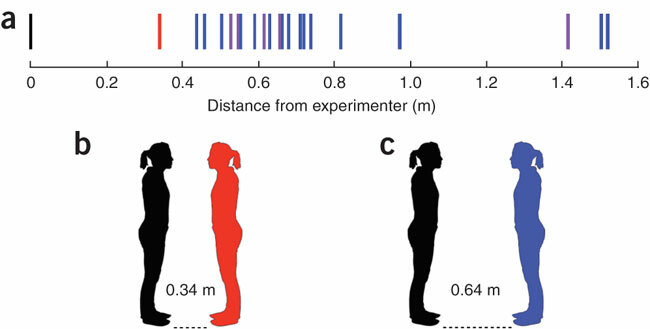 SM let experimenters get about twice as close as other subjects did, 0.34 meters versus 0.64 meters, the team reports online this week in Nature Neuroscience. She even felt fine standing nose to nose with an experimenter. (a) Preference of S.M. (red) was the closest distance to the experimenter (black), among age-, gender-, race- and education-matched controls (purple, n = 5), as well as general comparison subjects (blue, n = 15). (b) S.M. 's mean preferred distance from the experimenter (image drawn to scale). (c) Control participants' mean preferred distance from the experimenter, excluding the three largest outliers (image drawn to scale). You've got a great site here. I'm an aspiring psychologist and the things you write about interest me greatly. Just wanted to know I appreciate a smart individual.